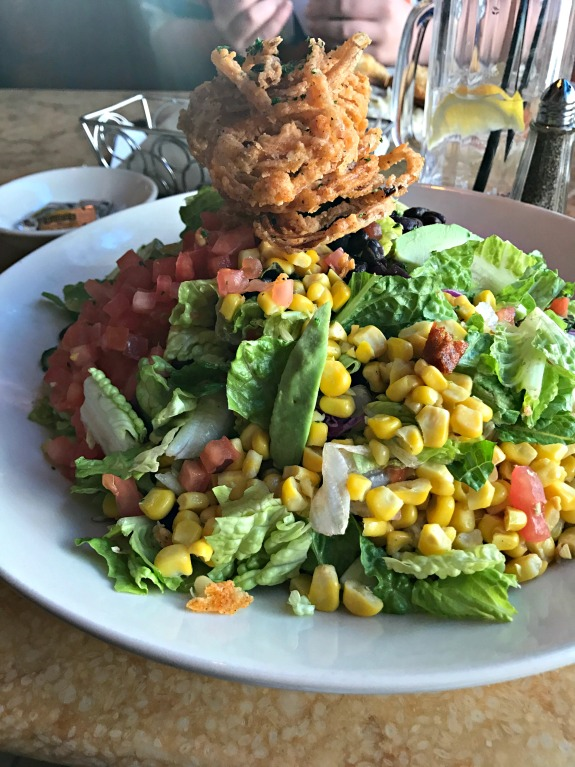 Today I can actually talk about what I ate on a different day than a Monday! I didn’t get enough pictures of what I ate in the city Monday night so instead, we can look at what I ate on Valentine’s Day. The usual pre and post run oatmeal. Nothing new here at all to the point where I couldn’t even take a picture of breakfast yesterday. Sometimes I think about switching my breakfast back to an English muffin with peanut butter as I was doing a couple of months ago but then I get all nutty about missing my oatmeal and so, there’s that. I had a random lunch craving! An egg sandwich was calling my name. I haven’t even had eggs in weeks but I was suddenly in the mood for an egg sandwich and nothing was going to stop me from making one right before a midday conference call. Please don’t ask me why I was craving parmesan cheese on this egg sandwich but I think my PMS hormones had something to do with it.. I piled things up and it all sort of fell apart when I went to cut it but it tasted really good regardless! My favorite little Valentine took me for dinner last night at our favorite spot, The Cheesecake Factory. My bunny (remember, that’s my son’s nick name and I can’t help but still call him bunny even though he is 13 and taller than me) even bought me candy with his own money the other night but then he ate that bag (it was peanut butter cups) so he went and got me another bag of candy to replace it. I was so happy to see this mixed bag of m&m’s in a pretty bag all for me! 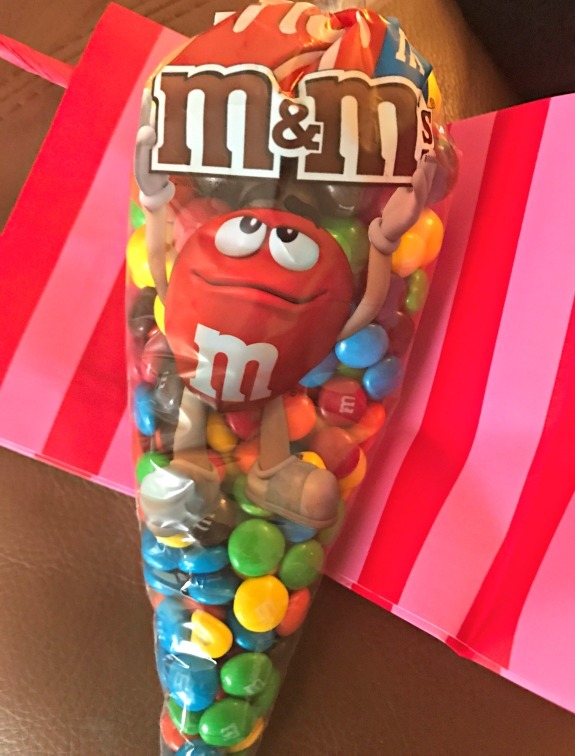 You know I can’t just eat a dinky little premeasured package of m&m’s (per my quirky eating habits post) so I was thrilled with this big bag mix which included plain, crispy and pretzel m&m’s! Did you eat chocolate yesterday? What kind? Any specific and random cravings lately? I dont think I ate any chocolate yesterday, which is weird because I eat some almost every day! When I saw the title of your post I thought you were going to share that you ate an egg sandwich from a Long Island deli. I used to live off of those in high school and when I was home from college. You cant get them as good anywhere else! ha, that’s so funny! egg sandwiches have never been my thing so I never get one from a deli (and never did) but everyone else loves them and orders them for sure! Yay for satisfying your cravings. 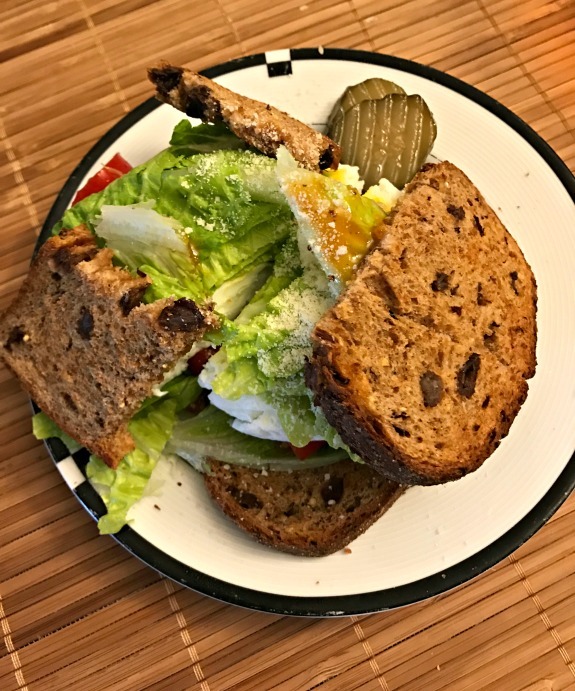 I’ve never had parmesan on my egg salad but I’d try it 🙂 And what a great idea to have a mixed bag of M&Ms. Though I’d probably choose pretzel, peanut and peanut butter for my own personal mix. I’m going to attempt to run today! I have been sick and out of commission since the weekend but woke up fever-less today so I’m going to see if I can get in a few miles. Surprisingly I didn’t have any chocolate yesterday… I just wasn’t in the mood for it! But lately I have been in the mood for frozen yogurt! I forsee that happening since its going to be 65 here this weekend. Im glad that you have a good valentines day! That egg sandwich looks really good! I like goat cheese or white cheddar on mine. The cheese is a good complement to the egg. I had a chocolate chip cookie and chocolate covered strawberries yesterday – both so good! Emily recently posted…A Single Gal’s Thoughts on Valentine’s Day + WIAW! I love how Ben bought you candy, ate it, and then re-bought you some more. I do that every year at Christmas! One year I bought Andrew two boxes of chocolate macadamia nuts from Costco because I knew I’d eat one box before Christmas, but then I actually ended up eating both boxes! So I had to buy THREE. The almond m & m’s are SO good. we all have our favorites, right? I didn’t eat any chocolate yesterday (not counting my breakfast chocolate milk)! How sad! I’m on a super strict food budget recently and talked myself down from buying a huge slice of chocolate cake after dinner, haha. I’ve been craving a lot of milk and chocolate milk recently, i don’t know what thats all about but its easy to fulfill! oh a huge slice of cake sounds terrific to me right now! I’m a BBQ sauce fiend, yet I’ve never thought to pair it with eggs. I’m intrigued! And yes, of course, to chocolate yesterday – in the form of 90% Lindt (one of my faves) and a mug brownie from Amanda @ Running with Spoons! I had no idea pretzel m&m’s even existed. Wow. That egg sandwich looks pretty stupendous, messy and all. Eggs sandwiches aren’t supposed to stay together anyway so you did it right.